A burn is a type of injury that may be caused by heat, cold, electricity, chemicals, light, radiation, or friction. 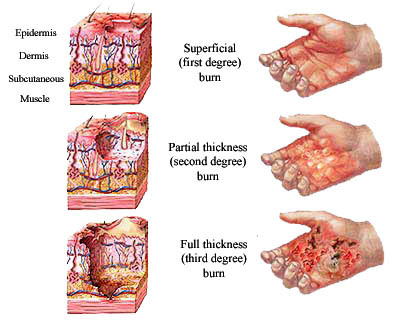 Burns can be highly variable in terms of the tissue affected, the severity, and resultant complications. Muscle, bone, blood vessel, and epidermal tissue can all be damaged with subsequent pain due to profound injury to nerves. Depending on the location affected and the degree of severity, a burn victim may experience a wide number of potentially fatal complications including shock, infection, electrolyte imbalance and respiratory distress. Beyond physical complications, burns can also result in severe psychological and emotional distress due to scarring and deformity. It is generally accepted that a burn affecting more than one percent of the body surface, (approximately area of the casualty’s palm) should be assessed by a medical practitioner.